France is peppered with wayside crosses. Some are modest and plain, fashioned out of a single lump of stone with perhaps a roughly incised date. Others are more elaborate, featuring carvings and inscriptions, in stone or iron. Some were erected for a specific purpose, like the one above. It’s a phylloxera cross. Phylloxera – more about that below – was an insect pest whose effects were first noted in France in 1863. It threatened to wipe out the vines and bring wine production to a standstill. 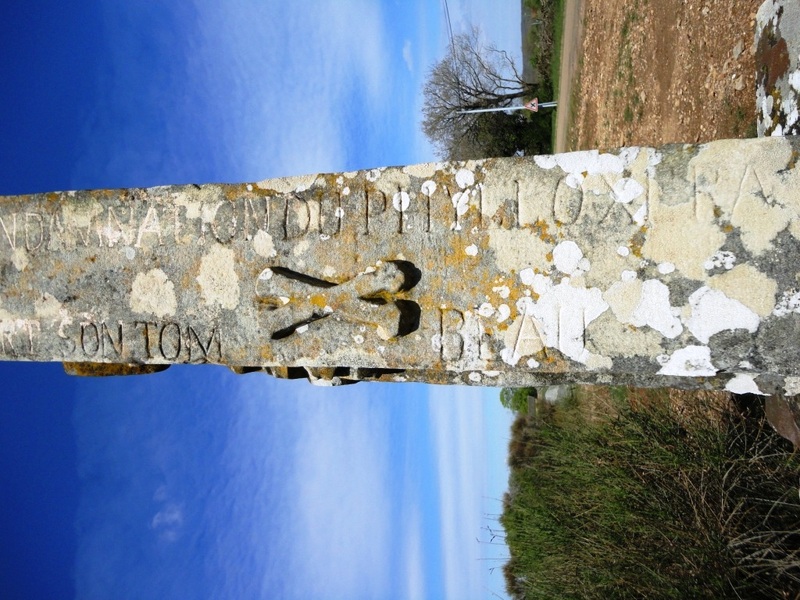 The cross above, near Saint-Igne in Ginals commune, dates to 1882. This was when the pest appeared in this area, having started in the Rhône Valley and, independently, around Bordeaux. Since nothing else appeared to stop its inexorable march, some viticulteurs turned to religion in a desperate attempt to rid the vines of this plague. Much of our area was under vines at the time, although it’s difficult to imagine that they produced high quality wines. Most of it was probably for local consumption. This cross is covered with religious images and inscriptions, notably, “Croix de grace pour nous” (cross of mercy for us) and the hopeful, “La condemnation du phylloxera sa mort son tombeau” (the judgment on phylloxera – its death, its tomb), picturesquely illustrated with a pair of crossed bones. The cross is the work of a local mason, F.P. Hébrard, whose carved signature appears elsewhere in the area. He probably enjoyed the challenge of carving it: more interesting than hewing lintels and corner stones. I have been unable to find out more: the story is probably in the archives. The story of phylloxera is long and complex and I can’t do more than give a brief impression of it. I have just finished a fascinating book about it by Christy Campbell (publication details below). The French wine industry was under assault from various biological scourges in the 19th century but phylloxera was the most serious. Most of them came from imported vine stock from America. Ironically, salvation also came from there. M. Borty, a wine merchant in Roquemaure in the Rhône Valley was an unwitting culprit. He planted American vines in his small, walled plot in 1862. From 1863, vines in the area started to die from a mysterious illness. The leaves turned yellow and then brown and the rootstock itself finally succumbed. When dug up, nothing could be detected except a fungal growth in some instances. It was only in 1868 that Jules-Emile Planchon, a botanist, and some colleagues found a mass of small insects feeding on the roots of a healthy vine. Once they had done their destructive work, the aphids moved on, hence they were never found on dying vines. The phylloxera vastatrix aphids were eventually proved the source of the blight and scientists mapped their complex life-cycle and how they spread. For a long time, though, the experts were divided and some thought the insects were an effect, not the cause. The history of the phylloxera blight is one of denial, fiercely contested views (most of them wrong), peasant obscurantism and initial government inertia. All this held back the search for a solution. Once the bugs were accepted as the cause, the French government offered a 30,000-france prize in 1870 – rising to 300,000 francs in 1874 – for finding a remedy. This, of course, opened the door to charlatanry. Snake-oil sellers also found a ready market amongst peasant farmers desperate for a cure. In addition to the superstitious, the crackpot and the downright dishonest, various remedies were tried, most of which failed. Using toads or birds to mop up the invaders. Attempts to introduce an insect predator also failed. At one point, human urine was thought to be effective and classes of schoolboys were marched out to urinate on the vines. That must have added a certain je ne sais quoi to the bouquet. Flooding the vineyards over winter to drown the bugs. This was partially successful, but only on plains with ready access to a lot of water. Some viticulteurs tried grubbing up and burning the vines and replanting with the same stock but the bugs always came back. Pumping various noxious substances, including arsenic, into the ground. Carbon bisulphide had some success but it was expensive and labour-intensive and, therefore, out of the reach of all but the richer growers. Nonetheless, many experts favoured this solution. Replacing the French vine varieties with American stock, which had developed a resistance to phylloxera. There was a lot of opposition and people claimed that the wine was ‘foxy’ and undrinkable. In any case, many American vine varieties didn’t thrive in the chalky French soil. Some suggested grafting French vine varieties onto American rootstock and this was eventually the solution adopted. (The proponents included Léo Laliman, who, paradoxically, was probably the one who introduced phylloxera to the Bordeaux area in the first place.) It took years of experiment and hybridisation, though, to find an American variety that would tolerate French soil and take grafts well. By the 1890s, the insect was routed but not defeated and wine production increased to pre-phylloxera levels. In the meantime, the French wine industry had changed enormously. The loss to the French economy caused by phylloxera was estimated at more than 10 billion francs. Some viticulteurs emigrated to Algeria, California or Chile, while others turned to alternative livelihoods. The wine industry bounced back but this resulted in over-production of low-alcohol plonk and the price plummeted. Then a fraudulent claret scandal adversely affected the world-wide reputation of Bordeaux wines. A tiny insect had a lot to answer for. There’s a lot more to it than I have narrated. Campbell’s book is a good read if you can overlook his over-dramatic style in places and chapter-end cliff-hangers. The 300,000 franc prize has never been awarded for the simple reason that phylloxera was never eradicated and is still with us today. And there is considerable debate in the wine industry about whether grafting affected the quality of the wines. In the end, it’s immaterial: it was the only solution. I’ll raise a glass to that. 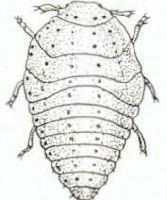 This entry was posted in Food/drink/recipes, History, Nature and tagged France, Phylloxera crisis, Phylloxera cross, Phylloxera vastatrix, vines, wine, wine industry. Bookmark the permalink. Thanks for this great post. I had made a link between the medieval Jews of Normandy and their impact on the wine trade, the fact there is a rue au juifs in Giverny and a rumour that Monet moved to Giverny at a time when there were vineyards on the hills behind his house. Your post has beautifully wrapped it up by giving the dates of the blight, because they are perfectly in line with a Monet’s time-line in Giverny and now of course there are no more vines. Thanks! Have a great weekend! Thank you for your kind words. The wine blight was absolutely devastating and it meant that, in areas where vines were grown but didn’t yield particularly good wine, they just gave up. I’m not saying this was the case in Normandy, but it was at the northern limit of where you could grow vines at that time (that limit has gone further northwards over a century). 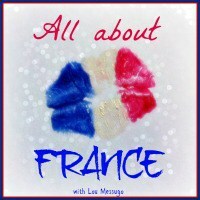 A bit late to say bon week-end, but bonne semaine quand même! Yes, only Pinot Noir gives decent wine up here, but we have such problems with mildew due to humidity that I’m not surprised that the gave up. I still want to have a few vines in my garden nevertheless! Happy week to you too! I knew little about phylloxera so thank you for all this interesting info. What mistakes man makes when he introduces non-native species. How little we understand about nature and its ways. I also knew very little about the history of phylloxera until I read the book I mention in the post. Then I began to understand more about the complex story. As you say, what terrible mistakes we make in our ignorance. Very interesting, thank you. I had never heard of phylloxera crosses before. Not being a wine growing area, there are none around here! It’s quite a work of art. The cross is rather more interesting than some of the plain ones around here. I think the mason allowed his artistic tendencies to run away with him. We only came across it by accident. I knew it was around there somewhere but there was no sign or anything – despite the fact that it is a listed monument. Alas, I don’t think the crosses on their own were able to defeat the blight. I didnt know the full story, though I was aware that much of the current French vines were descended from vines imported back from America. Some American wine ‘experts’ take great delight in pointing that out, though of course its only half the story. Actually, many French vines are indigenous French vines grafted onto American rootstock. That was the solution they came up with during the phylloxera crisis since the American vines had developed a resistance, although the bugs still lived on them. There are a few pockets of self-rooted indigenous French vines but not many. Chile imported a lot of vines from France pre-phylloxera and they (or their descendants) have survived because Chile is protected from the bugs by the Atacama Desert and Patagonia. Interesting story. 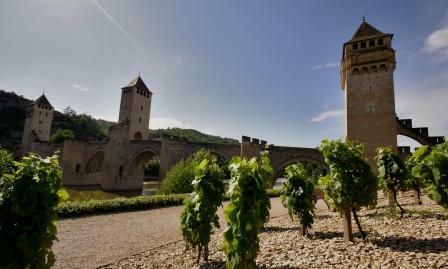 I also have an almost identical photo taken at the bridge in Cahors, vines and all. I knew very little about the story until I read the book I mention in the post, which is fascinating. As for the photo – it’s a classic shot but I have to admit it isn’t mine but taken from PhotoXpress free image website.